Catch a snag or catch a fish? Well there's a surprise its another snag! As we were leaving our first nights camp at Pen Pont we chatted with the Lady of the House, who kindly wished us well with our fishing as we waived our goodbyes. 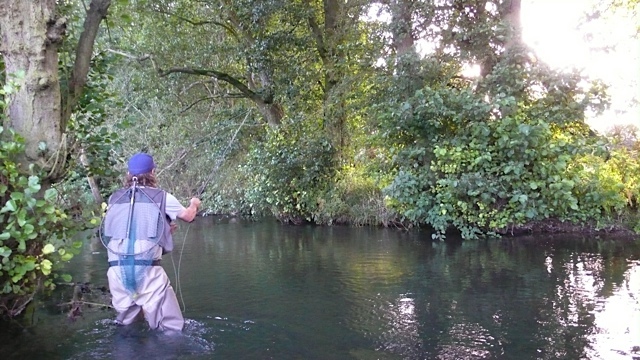 The fishing opportunities in the Brecon's are absolutely the stuff of fly fishing calendars, you can fish tumbling frothing gravel beds, weirs - both natural and man made, and the pokey streams and tributaries that feed the Usk and the Wye. If you've only ever fished reservoirs and stocked ponds, this will be a revelation to you, stalking without deer or rifle, stalking truly wild fish, in their truly wild habitat. I took a an 8ft 5/6 weight, which was OK for the more open sections but next time I go I'll be using a 4 weight no longer than 6ft and if I can afford it something smaller too. Word to the wise - studs, felt soles or better yet Studded Felt soles are a must. Or then again you could just sack the whole 'fishing' bit off and just go for an invigorating impromptu swim like I did. The Wye and Usk foundation have made a really great job of making these waters accessible. They publish a 'Passport' to the area with fairly detailed maps of the beats, and a Roving Voucher Scheme where you can pay-as-you-go by dropping tokens into boxes at the start of each beat. The Foundation is more than just a lobbying organisation: through a series of partnership projects, we are raising significant sums of money to remedy problems such as habitat degradation, poor water quality and diffuse pollution, barriers to fish migration and over-exploitation of our fisheries. To conserve, protect, rehabilitate and improve the salmon and other indigenous species of animal and plant life of the rivers Wye and Usk, their tributaries, streams and watercourses and the banks, riparian lands and catchments of the river. To advance the education of the public in the conservation of rivers, river corridors and their animal and plant life and the need for conservation, protection, rehabilitation and improvement of such environments.